Braid was right in his Batman: Arkham City review. Superhero games aren’t very good on the whole. For years, they were side scrolling beat-em-ups that didn’t take advantage of whatever made that character so special to begin with. I don’t necessarily blame the game designers. I’m sure they did the best they could. But the lack of creative vision and the limited ability of the technology meant that for years, Batman was just a Double Dragon style thug, Wolverine’s claws did as much damage as Storm’s punch, and Captain America and Iron Man were interchangeable characters in both personality and power. For me, all of that changed with the game based on Spider-man, Sam Raimi‘s 2002 film. For the first time, Spider-man wasn’t confined to a clunky side-scroller with limited web swinging ability. You had free reign to wander the island of Manhattan, stopping crimes, picking up collectables, or moving forward with a story based on the film. Since then, Spider-man has been the most consistent console hero. 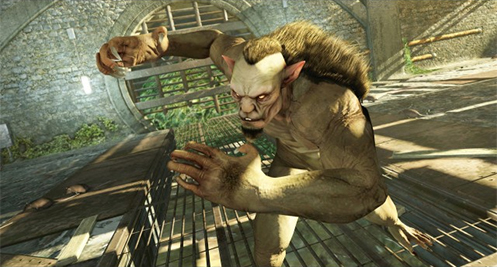 Raimi’s sequels each spawned a video game counterpart that followed in the footsteps of the previous games with a variety of improvements in graphics, control and gameplay. The open-world Spidey even continued into non-movie related games like Spider-Man: Web of Shadows. Why mess with what works, right? A few months after the events of the new feature film, Peter and Gwen decide to pay OsCorp a visit in hopes of learning more about the genetic experiments that made Spider-man a reality. Shortly after meeting Connors’ replacement, Alistaire Smythe, the couple discover that not only are there a bunch of genetic crossbreeds hidden deep within the OsCorp labs, but close proximity to Spiderman makes them all go crazy, break loose, and begin attacking people. Gwen, Alistaire and a handful of OsCorp scientists are locked in quarantine, but not before being exposed to a viral strain of the concoction that turned Dr. Connors into The Lizard. Now Spider-man must hunt down the escaped cross breeds and, with nowhere else to turn, work with Dr. Connors in hopes of creating a cure and saving Gwen. See the little yellow Spider-men dotting the screen? Those are your options of places to zip to using the web rush. 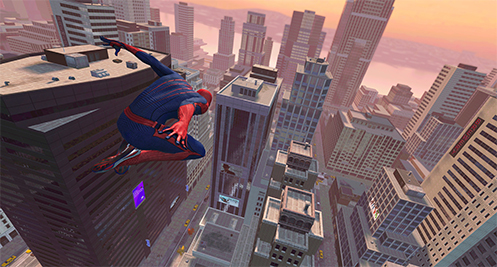 The Amazing Spider-man stays true to its free roaming predecessors, allowing players to swing through the streets of Manhattan with total freedom. Using your trusty map, you can set markers for yourself, targeting petty crimes, police chases, photographic side quests, or story missions. Each one offers plenty of XP and tech points which give you the opportunity to buy upgrades that give Spiderman new abilities. One of the most powerful new abilities is the web rush which allows the player to slow down time and really put those spider reflexes to work. Using the web rush, you can see all possible movements for Spiderman based on your current location. This means you can quickly bounce from enemy to enemy, attacking with a web-zip attack or jump safely out of harms way by selecting a high up perch without leaving yourself in danger while trying to spot a safe location. Throughout the game, the web rush makes it significantly easier to escape swarms of enemies, locate the weak spot on giant robotic enemies, or sneak up on guards to perform stealth takedowns. Like Batman without, you know, being Batman. If all of this sounds a bit familiar, its because it bears a striking similarity to Batman: Arkham City. While the Spider-man games may have been the first to really implement this type of gameplay in a superhero game, Arkham City perfected it and The Amazing Spider-man just feels like a cheap knockoff. The combat system functions very similarly to the Batman games (attacks, dodges and special attacks that open up when your combo meter gets high enough), but without any of the polish. 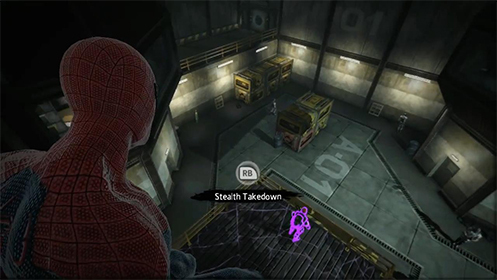 The stealth takedowns allow you to disable an enemy without an all out fight, but mostly just alert the rest of the enemies to your location. Unlike Batman, however, Spiderman has the ability to pick up objects like dumpsters and hurl them at his enemies….assuming the enemies are standing around the dumpster. The game controls don’t allow for much in the way of aim and thus, the few advantages Spiderman might have over the Dark Knight are nullified. Likewise, the side quests are all repetitive and don’t offer much variation in gameplay. If you stop a car chase, you are going to A) web zip to the offending vehicle, B) smash O until you’ve covered the windshield in web, and C) occasionally press triangle to dodge the shotgun blast from the passenger. Every. Single. Time. The only variation offered is the number of cars involved in the chase. Overall, the game offers a lot of monotonous side quests that feel even more lackluster after playing with the finely tuned controls of Batman: Arkham City. No bones about it, the story is completely unoriginal and makes hardly any sense after the events of the film. The brilliance of a game like Batman: Arkham City was that not only had the visuals and the controls been perfected, but the story was engaging and interesting. The Amazing Spider-man’s story just seems like a generic excuse to fight a bunch of B-List villains like The Iguana and random robot attackers. Dr. Connors (who you broke out of a mental institution instead of, you know, asking him to research while behind bars), needs a blood sample from a cross breed in order to create a vaccination? Well, better go chase a giant rat-man named Vermin into the sewers to get that sample. Never mind the fact that Spiderman is, himself, a crossbreed who could easily give a sample. There are a lot of things in The Amazing Spider-man that the creators seemed to overlook for the sake of….nothing. None of these plot holes were there to facilitate an awesome cutscene or a cool new skill. They just didn’t seem to care about building any depth into this game. What makes this even more frustrating is that this game was built by Beenox who, two years ago, brought us the astonishingly wonderful Spiderman: Shattered Dimensions, a game which would easily make any superhero top ten list. With all of the advances in technology, why does The Amazing Spider-man on the PS3 feel less developed then Spider-man 3 for the Wii? Hell, Gwen Stacy looks like a dude with a pony tail instead of looking like the super-hot Emma Stone. To add insult to injury, none of the cast decided it was worth showing up for and so we are left with a Tobey Maguire sound-alike for Spiderman (despite the fact that Andrew Garfield is now wearing the tights) and random generic voice actors to fill the remaining roles. Spiderman likes comics. Thats why he has to collect 700 of them. Seriously. Not joking. I want to be clear. I didn’t HATE The Amazing Spider-man. In fact, sometimes I had a lot of fun with it. I just think its a shame to see such wasted potential. With Batman: Arkham Asylum nearly three years old now, it doesn’t seem like a game company should have too much problem recreating it. Hell, SEGA did it for Captain America: Super Soldier with more positive results and that was, again, made by SEGA. SEGA! SEGA even got the film’s cast to star in the Captain America game. But I’m more then willing to overlook a flawed combat system and lack of voice talent if the story is there but in this case, it just isn’t. 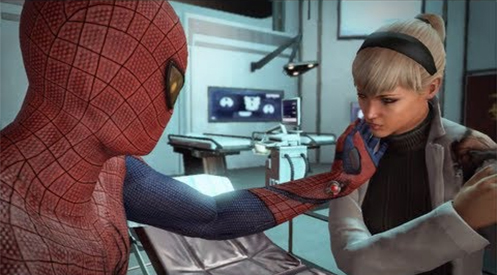 After playing Spiderman: Shattered Dimensions, I thought Spiderman was in safe hands with Beenox, but now, I’m not so sure. In the time leading up to playing this game, I was excited to swing through Manhattan as everyone’s favorite web-slinger. But, after investing 12 hours in gameplay (and getting 100% completion and a Platinum trophy), I think its time to pay Gotham City another visit. ~ by Andrew Craig on July 7, 2012. Fantastic blog! Do you’ve any helpful hints for aspiring writers? I’m hoping to begin my own website quickly but I’m a little misplaced on everything. Would you advise starting having a totally free platform like WordPress or go for a paid choice? There are so many options out there that I’m totally overwhelmed .. Any suggestions? Appreciate it!